A rally against gun violence at Pack Square in Asheville on Feb. 18 drew upward of 250 participants. In the wake of the Feb. 14 shooting at Marjory Stoneman Douglas High School in Parkland, Fla., where 17 people were killed, locals planned the event in conjunction with the national Moms Demand Action for Gun Sense in America and Everytown for Gun Safety rally. A group of mothers put together the Asheville rally in less than 48 hours, according to Katie Locke, an event organizer. The effort arose from social media discussions over what to do locally after the mass shooting in Florida, one of the deadliest of the more than 200 school shootings since the Sandy Hook Elementary School shooting in 2012. Rev. Sara Wilcox, pastor of Land of the Sky United Church of Christ, asked those gathered to recognize that “this world, though broken and hurting, is filled with beautiful people,” and led the crowd in prayer, asking God to take away the fear that breeds suspicion of neighbors and the nation’s love of violence and “give to us wisdom that we may be the change we seek.” In a running theme among the speakers, Wilcox accused politicians of offering thoughts and prayers but no solutions. Other speakers included Buncombe County Commissioner Jasmine Beach-Ferrara, District 115 N.C. Rep. John Ager, an Asheville High School student, an alumnus of Stoneman Douglas, musicians and teachers. Those who spoke recognized the victims of the school shooting in Florida and expressed their desire for legislation that could prevent mass shootings and rein in gun violence. Alex Davis, who graduated from Stoneman Douglas and now lives in Asheville, shared his sorrow at the tragedy inflicted on his alma mater but also his pride at the student reaction. He said he was amazed by the poise exhibited by students as they spoke out for change in the national media. “I want Stoneman Douglas High School to be remembered as the tipping point, the straw that broke the camel’s back,” Davis said. He added that there is much to disagree about when it comes to gun legislation, but he suggested people start by agreeing that children deserve better. FBI and local law enforcement failed. Period. You can parade out all the little tykes and old liberals you want to. The culture is sick because the old liberals made sure to marginalize males. The signs were there concerning the shooter. THEY WERE IGNORED. Better to ask why is it so easy to enter GUN FREE ZONES and KILL. Because both are against the law last I heard. And all this tells me is since law enforcement, mental health, and social services failed to go after the shooter BEFORE the shooting even though there was plenty of TIME and EVIDENCE and 39 CALLS TO THE POLICE, that others should LOSE their rights. I really don’t think that losing rights because the government and cops failed to do their jobs is smart. Here’s what makes the culture sick: a generation of kids is being told to accept active shooter drills and prison-grade security and regular massacres so that insecure men can continue to own AR-15s. It won’t be long before those kids are old enough to vote. HAHA…good one. They won’t vote. It requires leaving your parents house. Keep telling them that as loudly and obnoxiously as you clearly can. LOL why sure but can you also inform them at these protest that leftist also want open borders and hordes of illegals to magically become voters as well? Why of course not because if these kids realized that open borders and illegals who get gifts and prizes of welfare automatically along with working and paying no taxes, are actually a huge threat to them and their ability to survive. In fact much worse than these episodes at schools. Simply because they will not only take jobs and government freebies, they’ll take over everything else as well and drive it to bankruptcy and ruin. Your inability to stay on topic for more than three seconds is a thing of wonder. killers and causes them to ‘over react’ … PILLS. .. Is YOUR child on ritalin or adderall ? GUN FREE ZONES KILL ! Dozens of people showed up. The outrage has already passed. “There is nothing that can be done” say the politicians in the only country in the world where this happens regularly; then they collect their check from the NRA. In Australia, they turned this around. Why don’t we? Greed by the corporations and ignorance by the people. The USA is not Australia…. What adults need to do is apply more critical thinking, notice patterns, question things that don’t add up and be very suspicious of things like: amazingly articulate and composed kids that received verbal grooming for the cameras, the media exclusively featuring kids and adults who want to change laws, blame the President, etc. AND in less than one week — the professionally-organized marches soon to occur all around the country and with PAID participants!! Time to wake up, folks! Use your brains. Btw, his name is George Soros. Oh well… At least you’re not claiming the shooting actually didn’t happen, the way the right-wing loon conspiracy theorists do about Sandy Hook. Tell me you’re not doing that. Tell me you’re not casting aspersions upon these high schoolers. Because that is so absurd, and so low an act, that you surely can’t expect anyone to take you seriously after that. Sigh…..unsurprisingly, we have two low-information commenters operating in the “required” manner of attacking the messenger because they have nothing of value to add regarding the information put forth. Acquire some more info other than what CNN and Yahoo spout and then we can have a conversation. There’s plenty out there but you have to exert a little bit and use come critical thinking. 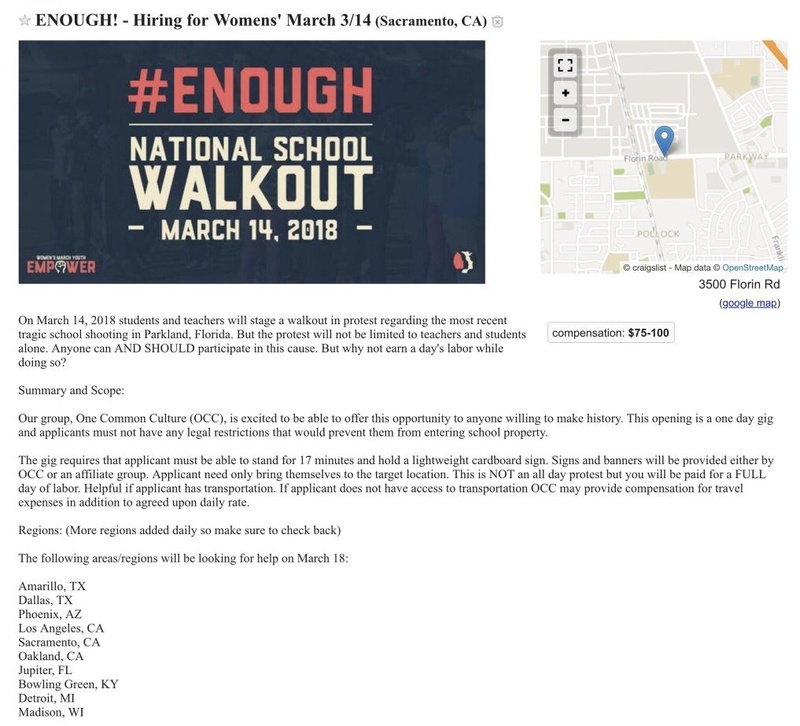 Meanwhile, I can only deduce that you have no problem with largely phony protests, organized by professionals, with paid participants working a “gig” and that the mainstream media doesn’t tell you that that is the case. Lots of deception and, clearly, there are plenty who can easily be fooled. Ok, so you are. You’re ARE doing just that. You’re saying they’re being paid, groomed to do this. You’re saying that a conspiracy is afoot, with George Soros behind it. You are denigrating the experience these children just went through, and you’re denigrating their lawful, willful, and inspiring actions to prevent it from happening again. You should be ashamed. Should be. I know you aren’t. No, the problem isn’t not having enough information, or not employing critical thinking or anything like that. The problem we face here is that I’m obtaining my information from the real world, whereas the right-wing loon conspiracy theorists obtain theirs from the made up world where they live, quite apart from the real world where the rest of us are. I mean, you’re one small step up from spouting off about “crisis actors” and I’m supposed to be low-information? And right on cue, TRW shows up with his never-ending conspiracy theories, telling us the truth can only be found on obscure websites and random YouTube channels because a shadowy Jew is controlling the media and warping sheeple’s minds. There’s a sad sickness to it. And still, the usual bots are only able to make personal attacks rather than address the info presented. It’s in line with the binary programming used to keep things simple for them so that they stay on message and don’t engage in critical thinking, information gathering other than Yahoo or having to, gasp – God forbid, engage in mature discussion. Nope, the bots stick with 8th grade dialogue, as instructed. Okay, this pot-kettle routine is about enough. You are all pushing the limits on what I am able to deem respectful conversation (stretch though I may, in the name of letting you all make your points). No more little jabs at one another on this thread. If you want to criticize something, make it the arguments and refrain from anything resembling ad-hominem arguments. I am cinching this thing down, so if you find your comment has been removed, try again without making a value judgement about a fellow commenter. Thank you. What, pray tell, is the appropriate counterargument within this particular forum to “it’s all a plot by a shadowy Jew, sheeple, so stop taking your facts from ‘news’ sources”? That’s up to you, but you can’t just call somebody names until their argument goes away. If you want to say those notions are laughable conspiracy theories, fine, dismiss away, just be civil to the person making the argument. LOL moms demand action well how about not having little rugrats that have to be taken care by the system. YES! and ARM the teachers with leadership skills! Well, most of the hoopla right now is about ARMING the teachers, period. If we’re going to go that route and basically demand that armed security officers educate children, how about we pay them accordingly? Average cop pay in NC is around $50k. Average teacher pay is around $42k. We’re not going to go that route because it is stupid and the NRA’s preferred distraction. Two decades of letting the NRA dictate its preferred laws (as few as possible) and its preferred solutions (everybody having more guns) have not worked. They should be treated as the loud extremist minority that they are, and sensible people should be empowered to come up with sensible ways to keep kids safe.